G.I. Joe Universe G.I. Joe - Classic Collection Series 11 - D.E.F. G.I. Joe - Classic Collection - Series 11 - D.E.F. 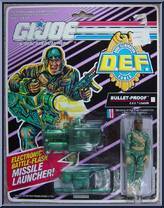 BULLET-PROOF served in Central America, the Golden Triangle, and the Caribbean as a field officer of the Drug Enforcement Agency before drawing the assignment to head G. I. Joe's D.E.F. detachment. Hi. . .
Intercepting drug-runners in coastal waters and on the high seas is a specialty of the U.S. Coast Guard and that's where CUTTER learned his craft. He was the skipper of a high-speed drug interceptor c. . . The Headman recruits his personal bodyguards from the greediest, most ruthless drug dealers and criminals in the world! He offers them a big money stake in his global operation and a chance to live ou. . . The HEADMAN started out mugging old ladies for their Social Security checks, moved on to robbing convenience stores, then learned the ropes about drug dealing while serving time in the state penitenti. 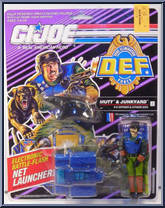 . .
MUTT and JUNKYARD have worked together for so long, they no longer need to give each other audible or visible signals. It's almost as if they function as one organism. On D.E.F. 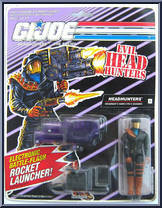 operations, Junkyard s. . .
A former choirboy and Detroit police officer, SHOCKWAVE had all the qualifications to be the point-man for the special G. I. Joe D.E.F. detachment. Every special weapons team needs a "door-kicker. . .